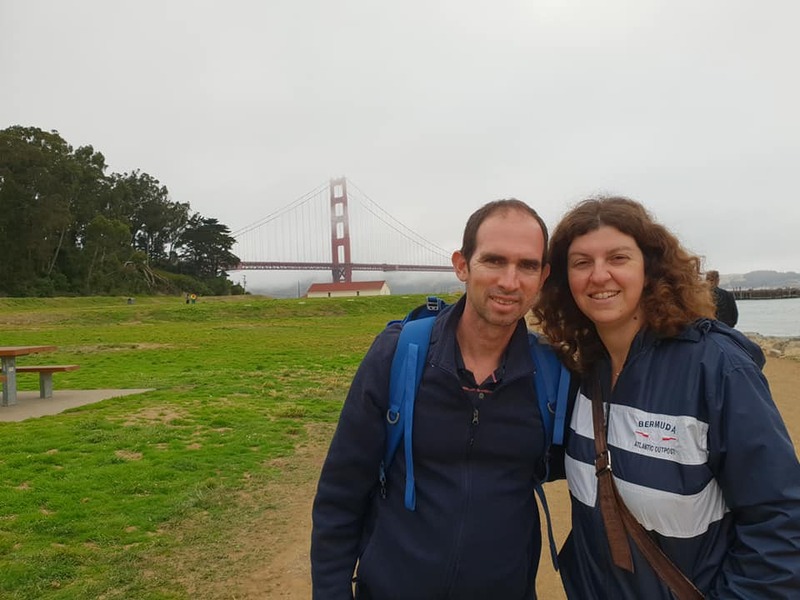 Day's description: The City by the Bay is famous for the Golden Gate Bridge, Fisherman’s Wharf, Alamo Park, Alcatraz, cultural diversity, performing arts, beaches, and excellent public transportation options. Go for the sophistication, leave inspired. Buy the Use Go card SF -Build your own pass and get 20% for all attractions in 30 days. San Francisco International Airport station is a Bay Area Rapid Transit reversal station on the Antioch–SFO/Millbrae line located inside the San Francisco International Airport, also known as SFO or SFIA. The station is located on the departures level of the International Terminal, next to Parking more.. Garage G. There are two entrances and exits – one adjacent to the grand foyer off the north side of the International Terminal; and the other is a level up at the Garage G/BART AirTrain station. less.. Ordered on 24/5/18, 147$ 60 minutes 13:15 ,14:15, 15:15, 16:30,17:30, 18:30. Pier 39 is a shopping center and popular tourist attraction built on a pier in San Francisco, California. At Pier 39, there are shops, restaurants, a video arcade, street performances, the Aquarium of the Bay, virtual 3D rides, and views of California sea lions hauled out on docks on Pier 39's more.. marina. A two-story carousel is one of the pier's more dominant features, although it is not directly visible from the street and sits towards the end of the pier. The family-oriented entertainment and presence of marine mammals make this a popular tourist location for families with kids. The pier is located at the edge of the Fisherman's Wharf district and is close to North Beach, Chinatown, and the Embarcadero. The area is easily accessible with the historic F Market streetcars. From the pier one can see Angel Island, Alcatraz Island, the Golden Gate Bridge, and the Bay Bridge. Blue & Gold Fleet's bay cruises leave from Pier 39. less.. The San Francisco Zoo is a 100-acre zoo located in the southwestern corner of San Francisco, California, between Lake Merced and the Pacific Ocean along the Great Highway. The zoo's main entrance, once located on the north side across Sloat Boulevard and one block south of the Muni Metro L Taraval more.. line, is now to the west on the ocean side of the zoo off of the Great Highway. This zoo is the birthplace of Koko the gorilla, and, since 1974, the home of Elly, the oldest black rhinoceros in North America. It houses more than 1000 individual animals representing over 250 species, as of 2016. less..
Fisherman's Wharf may refer to: Fisherman's Wharf, Monterey, California, a historic fishing wharf in Monterey, California Fisherman's Wharf, San Francisco, a tourist destination and still-functioning wharf, in San Francisco, California Tamsui Fisherman's Wharf, a wharf located in Danshuei Township, more.. Taiwan Kaohsiung Fisherman's Wharf, a wharf located in the city of Kaohsiung, Taiwan Fisherman's Wharf, Kowloon, Hong Kong, the former name of The Laguna Mall, a shopping mall located in Tai Wan, Hong Kong Macau Fisherman's Wharf, a theme park located in Macau, China Fisherman's Wharf, a Stan Rogers' song on the Fogarty's Cove album Fisherman's Wharf, a 1939 American drama film less.. Reserved tickets online from Madame Tussaude website: 20$ per adult, 14 child (3 - 12). Madame Tussauds San Francisco is a wax museum located in Fisherman’s Wharf, San Francisco in California. The attraction opened on June 26, 2014 and became the 17th Madame Tussauds museum to open worldwide. The attraction features wax figures of famous figures from movies, music, politics, popular more.. culture and sport. It also celebrates “The Spirit of San Francisco” with wax figures of local artists, musicians and activists from the city’s past. less..
Twin Peaks is an American mystery horror drama television series created by Mark Frost and David Lynch that premiered on April 8, 1990, on ABC. Its story follows an investigation headed by FBI Special Agent Dale Cooper into the murder of homecoming queen Laura Palmer in the fictional suburban town more.. of Twin Peaks, Washington. The show's narrative draws on elements of detective fiction, but its uncanny tone, supernatural elements, and campy, melodramatic portrayal of eccentric characters also draw on American soap opera and horror tropes. Like much of Lynch's work, it is distinguished by surrealism, offbeat humor, and distinctive cinematography. The acclaimed score was composed by Angelo Badalamenti in collaboration with Lynch.Twin Peaks was one of the top-rated series of 1990, but declining ratings led to its cancellation after its second season in 1991. It nonetheless gained a cult following and has been referenced in a wide variety of media. In subsequent years, Twin Peaks has often been listed among the greatest television series of all time.The series was followed by a 1992 feature film, Twin Peaks: Fire Walk with Me, that serves as a prequel to the series. Following a hiatus of over 25 years, the show returned in May 2017 as a limited series on Showtime, also known as Twin Peaks: The Return. The series comprised 18 episodes written by Lynch and Frost, and was directed by Lynch. Many original cast members, including MacLachlan, returned. less.. The California Academy of Sciences is a research institute and natural history museum in San Francisco, California, that is among the largest museums of natural history in the world, housing over 26 million specimens. The Academy began in 1853 as a learned society and still carries out a large more.. amount of original research, with exhibits and education becoming significant endeavors of the museum during the 20th century. It is California's oldest museum. Completely rebuilt in 2008, the building covers 400,000 square feet and is among the newest natural history museums in the United States. The primary building in Golden Gate Park reopened on September 27, 2008. less..
Japanese Tea Garden may refer to: Japanese Tea Garden, a feature of Golden Gate Park Fort Worth Japanese Garden, a Japanese garden in the Fort Worth Botanic Garden Portland Japanese Garden, a traditional Japanese garden in Portland, Oregon San Antonio Japanese Tea Garden, a garden in Brackenridge more.. Park, San Antonio, Texas Seattle Japanese Garden, a Japanese garden in the Madison Park neighborhood of Seattle less.. The M. H. de Young Memorial Museum, commonly referred as the de Young, is a fine arts museum located in San Francisco's Golden Gate Park, and one of the Fine Arts Museums of San Francisco along with the Legion of Honor. The de Young is named for its founder, early San Francisco newspaperman M. H. more.. de Young. Since June 1, 2016, Max Hollein has served as the Director and CEO of the Fine Arts Museums of San Francisco, overseeing the de Young and Legion of Honor museums. less..